OK, in this video, we are going to meet the logical fallacies. We are going to first talk about what the logical fallacies are exactly, and then we're going to meet them in terms of examples. So first off, logical fallacies. There is actually formal logic here that deals with logical fallacies. We simply need to note that the argument is not valid for a certain reason. However we decide to phrase that is the key because the GRE's not testing our ability to know Latin words for logical fallacies, but really, they're testing the way we think. They want to know, Can we identify the holes in this argument? So that said, here when I go and give my examples of logical fallacies, I've just given them my own names. So we can put them in categories, so we know what to look for. So first off, we have the 'things change' fallacy. Again, it doesn't sound very formal at all. Of course, that's not the point. So what is the 'things change' fallacy? Here is an example. It says, "In 85, Hamson, a leading player in the aftershave market, launched a successful ad campaign. Therefore, Hamson, if it wants to repeat the success, should launch the same ad campaign." Well, hold on. Things change. What worked in 1985 isn't necessarily going to work today. Why? Well, maybe the people. Their customer base has changed. So if an ad campaign targeted older men and had maybe images of yachts or whatever the old man like, it would not work if now Hamson targets a younger demographics. It could be all these reasons why this argument doesn't hold true, but as soon as you see this, you go, "OK. That's a 'things change'." So base my attack of the argument on that, and then of course you want to come up with the reasons why things change. How do things change? Of course, I gave you an example just now, the demographics. That's what we're going to do here on most of these examples. I'm going to basically tell you the name of it, how it pertains to this argument, or how it pertains to this example, and then, of course, how we can come up with alternate explanations to improve the argument. OK, let's try it with number two. 'Assumed cause and effect'. What's the assumed cause and effect? Let's have a look. "After instituting a comprehensive bilingual education program, Monte High witnessed the greatest percent of its senior class go on to college. Therefore, Monte High should continue the bilingual education program." Well, wait a second. Just because they bought this bilingual education program doesn't mean suddenly, "Oh, that's why people were accepted to colleges." As though colleges were basing their admissions solely on whether or not these students here had taken a bilingual program. 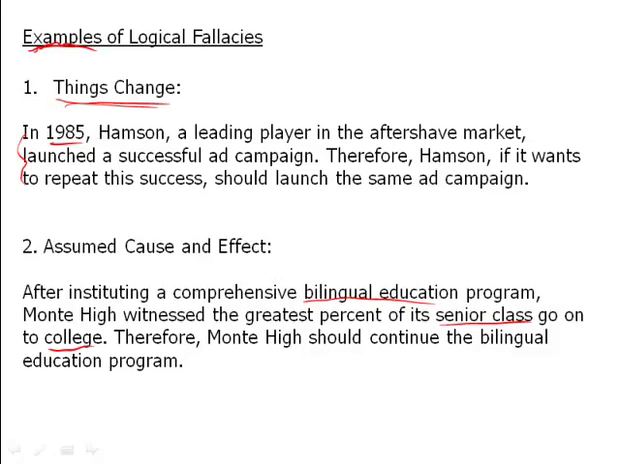 All of these reasons could work, or account for the fact that more Monte High seniors than ever before went on to attend college, so you can't just assume that it's bilingual education. OK, so those are two. Now, we have a few more to go. Let's take a look at the next one, 'numbers and percentage assumptions'. What's going on here? Let's see, more students, here you go, Monte High again. "More students from this year senior class went on to college. Therefore, the year's seniors are Monte High's most successful." So you have more. You have a number here. What does this number mean? Well, imagine this: imagine let's just make it a 2010 class here, Monty High. This 2010 class, you had 100 students, and 99 went on to attend college. That's amazing, wow. And then this year 2011, the year we're talking about here, we had 200 students in the classroom. They combined with maybe another school, and out of the 200, 100 went on to college, which is more than 99, but wait a second. Is that necessarily better? Math assumptions, if you think of it in math terms. OK. Now, for the next one, we have 'vague language'. What do have here? S"tudies have shown that those who eat three maxomeal fruit bars a day are in better shape than those who eat a normal diet." OK, wait a second. What do we mean in better shape? How do you quantify that? How do you come up with this? This is very vague, "than those who eat a normal diet." Is there anything wrong with that? Of course, try to take apart the argument based on these things. Don't just say, the language is vague, end of story. No, the language is vague, What must the argument do to make this language less vague? Well, give us something specific here. OK, there are a few more to go as I said. And next one, we have 'not all X are alike', so X being a certain group. So "A recent study found that 50-65 year olds in Gambitville responded favorably to a new anti-cholesterol drug. Therefore 50-65 year old males in Smugsburg will also respond favorably to the drug." OK, so it is assuming what? That 50-65 year olds in Gambitville are the same as the 50-65 year olds in Smugville. Obviously, there's going to be a significant overlap. They're both males, same group. However, there can also be subtle differences. So what can be some subtle differences? Or maybe, they're not even that subtle. Maybe Gambitville is in a part of the country where they're fond of very rich, heavy foods, and Smugsburg is maybe more similar to where I live in California, where people are very much into eating healthy and fitness. We don't know, but you can't compare one group to another group in a different country. They're not alike, or different city in this case. They're not alike in all cases. So, of course, you want to come up with some alternative explanations So next one is 'don't trust a survey'. This one is pretty typical. You can kind of see this one coming from a mile away, so it usually says, according to some sort of survey. So according to the latest survey, "the residents of Monroe Town are unlikely to commute to neighboring Jacksonburg unless a new highway is constructed. Therefore, the highway should be constructed." Well, OK. So it's assuming that just because the survey said something, that we can really trust the results. So did it poll all of the residents from the town? Maybe just specific ones, and even if it polled all the residents, just because these residents say something that, "Oh yeah, we're going to start commuting if this highway's constructed", doesn't mean that they are actually going to start commuting once the highway is constructed. So again, that's what you want to look for, and then finally, we have here, 'apples aren't oranges'. I call this the 'different cities', and you'll see why in a minute. But the idea that two things, you assume two things are alike, but they're not because apples aren't oranges. And what do we have here? We have, "Since building a subway system, Gap Town has been able to cut down on its citizen's average commute. Therefore, Percyville should also build a subway if it wants to reduce the average commute for its citizens." OK, so what's going on here? Well, we're assuming that what works for Gap Town, this subway system right here, is going to work for Percyville. So, therefore, because it worked in Gap Town, it should work in Percyville, this subway system. But wait a second. How do we know that's the case? Maybe Percyville and Gap Town are very different. So very different, or not alike, do not equal one another. But of course, you can't just stop there. You have to say, why? Maybe Percyville most have to commute long distances. Maybe there is no central downtown. And therefore, building a subway system isn't going to do much good. So you can maybe go into depth about traffic patterns, any other possible explanations, that's what you're going for here. Once you identify, in your own words, please don't put out, this is an apples to orange fallacy. You want to simply say the argument assumes that Gap Town is the same as Percyville, however, these two cities can differ for many reasons.